Jamey Aebersold Jazz Play-A-Long Volume 36 PDF + Mp3 CD download. Bebop And Beyond. Intermediate/Advanced. Includes 8 tunes by a variety of jazz greats that have been recorded on many records in the past 40 years and songs by Jamey in the same style. If you listen to jazz records, you’ve heard these tunes. Composers represented here include such heavies as Tadd Dameron, Thelonious Monk, Ray Brown, and Tommy Flanagan. Smokin’ rhythm section keeps you inspired from the first note to the last! Learn and enjoy these great tunes. 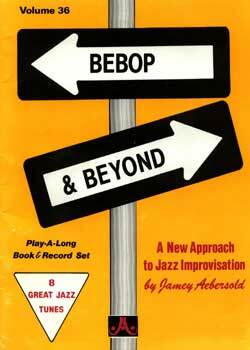 Download Jamey Aebersold – Jazz Play-A-Long Volume 36 PDF free and other books from our site. Only high quality PDF scans. Please write a review, it's important for our community.